Pope Francis Calls for Peace in Visit to "Jerusalem of the West"
Some 100,000 people are expected to come from across the region to Sarajevo, a largely Muslim city. Pope Francis urged Bosnia's Muslims, Orthodox and Catholics to put the "deep wounds" of their past behind them and work together for a peaceful future as he arrived in Sarajevo on Saturday for a one-day visit to encourage reconciliation following the devastating three-way war of the 1990s. Francis received a joyous welcome from thousands of cheering Bosnians who lined his motorcade route through the mostly Muslim city of 300,000. Another 65,000 people, most of them Catholics, packed the same Sarajevo stadium where St. John Paul II presided over an emotional post-war Mass of reconciliation in 1997. "We all need peace and to receive the pope's message," said Alma Mehmedic, a 55-year-old Muslim who waited for a glimpse of Francis outside the presidential palace. "I came today to give love and receive love." In a speech to Bosnia's three-member presidency, Francis called for Bosnians to oppose the "barbarity" of those who want to continue sowing division "as a pretext for further unspeakable violence." Rather, he urged Bosnians to continue working for peace and respectful coexistence through patient, trustful dialogue. "This will allow different voices to unite in creating a melody of sublime nobility and beauty, instead of the fanatical cries of hatred," he said. Nearly every step of Francis' day was designed to show off interfaith and interethnic harmony in a city once known as "Europe's Jerusalem" for the peaceful coexistence of Christians, Muslims and Jews. The city, though, became synonymous with religious enmity during the 1992-95 conflict that left 100,000 dead and displaced half the population. Children dressed in traditional folk outfits representing Bosnia's three main religious confessions greeted Francis at the airport, Muslim carpenters crafted the wooden throne he sat on and a Catholic pigeon breeder provided the white pigeons that the three presidents and Francis set free in a sign of peace at the end of their meeting. "I saw this hope today, these children who greeted me at the airport," Francis said in a deviation from his speech. "Muslim, Orthodox, Jewish, Catholic and other minorities: Together. Joyful. That is hope." Despite the outward show of harmony, wounds still fester two decades after U.S.-brokered peace accords ended the war. Bosnia's Christian Orthodox Serbs want a breakaway state; Muslim Bosniaks want a unified country; and Roman Catholic Croats want their own autonomous region. 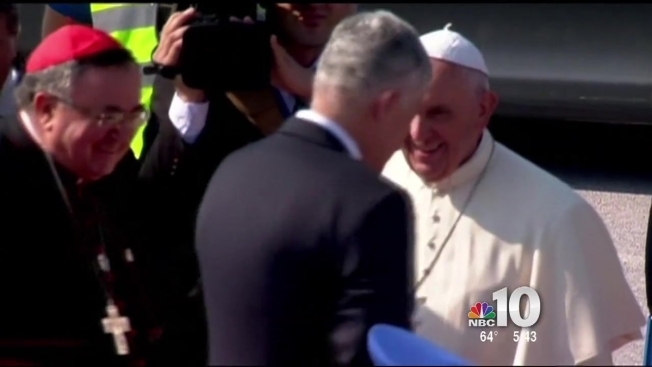 The Serb chairman of Bosnia's three-member presidency, Mladen Ivanic, welcomed the pontiff by saying Bosnia-Herzegovina is a country of contrasts where "every word echoes much stronger and longer than elsewhere," a country of deep emotions of love and mercy but also of the opposite, a country that can either connect or divide Europe from Asia. "We believe that the times of misunderstandings, intolerance and division are behind us forever, that we have learned our lessons from the past and that new times are ahead of us, times of reason, reconciliation and cooperation," he said. Security was tight as thousands of police officers stood guard along Francis' motorcade route through the city; shops and cafes were closed and residents along the route were told not to open their windows or stand on balconies. But they lined the route in droves and Francis' open-sided car drove slowly by. "The pope cannot create jobs for us or improve the political situation in our country, but he can give us hope and strengthen our faith," said Stipe Turalija, a 15-year-old Bosnian Croat. In addition to the Mass, the 78-year-old Jesuit had a packed schedule, with meetings with government officials, an encounter with priests and nuns from the region, as well as an interfaith gathering and finally a rally with young people. Some 100,000 people were expected to come from across the region to Sarajevo. Francis has said he wants to encourage reconciliation, but also encourage the Catholic Croat community, which represents only about 15 percent of the population — down from more than 17 percent before the war. Muslim Bosniaks account for 40 percent and Orthodox Christian Serbs 31 percent, according to Vatican statistics. Many Catholics, who carry Croat passports, have left Bosnia, where the unemployment rate stands at 43 percent and youth unemployment at 67 percent. John Paul had tried to visit Sarajevo during the war, but the trip was called off for security reasons. His willingness to even consider a trip endeared him to a city that felt abandoned and betrayed by the world — sentiments of affection that have been projected onto his successor two decades later.